8 Membership type. Ready with 8 membership type (1 Free membership and 7 Paid membership) with each commission configuration. Unlimited Download & Article product. Sell unlimited downloads and articles with categories and create access limitation based the membership type. Powerful Network Options. Works with customizable matrix options, the width and depth can be determined freely (nXn) with Cycle Matrix and powerful Bonus Options. Powerful Bonus Options. Come with Cycle Bonus, Sponsor Bonus, Level Bonus and Point Reward. You can set them to any amount you wish, set the condition for commission to be paid also set commission in percentage or fixed amount. Email and SMS notification. You can set email notifications and even a SMS notifications to your members notifying their account status. Rewarding Point. Create offer for your members using reward point, give them any bonus when they achieve some values of reward point. Easy To Design. egMember is working with smarty template system so it is easy to work with html codes using any standard html editor. You will be able to design easier, add more links or page without any restriction. Image Manager. Changing images on the website can be a difficult job. But in egMember it becomes very easy using the Image Manager to upload your image or your company logo. Uploading images is no longer done by manually! Banner Slider. You can place promotional banner images on the front page also in member area automatically, We guarantee that your website will be more interesting! Customizable Membership Subscription. 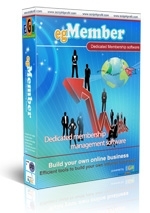 egMember can handle of subscription period such as Daily, Weekly, Monthly or Yearly. The subscription handled automatically. Payment & Withdrawal Plugins. An open source code php files which work with Online Payment Processors and various payment through Bank transfer, you are able to create another payment plugins.